FHWA Contact: Jennifer Nicks, HRDI-40, (202) 493-3075, jennifer.nicks@dot.gov. State and local transportation agencies frequently use open-graded aggregates for wall, roadway, and bridge construction. The primary advantages of using this type of material in wall and abutment applications are ease of constructability, lighter in-place density than well-graded materials, very low fine content, free-draining characteristics, and simpler quality assurance testing, using a method specification for field density. The American Association of State Highway and Transportation Officials (AASHTO) classifies open-graded aggregates according to the M43 gradation based on standard sizes for processed aggregates. (1) Despite common use of these aggregates, their strength characteristics have not been systematically measured or used in design. Instead, engineers frequently use a default friction angle of 34°, leading to potential conservatism in retaining wall and foundation design. The primary purpose of this TechBrief is to present research results on the strength properties of standard open aggregates tested in a large-scale direct shear (LSDS) device to improve the state of practice for the design of structures using these materials. The most commonly used laboratory devices available to measure the strength of aggregates are the direct shear (DS) and triaxial (TX) tests, with DS being the simplest and most regularly used test. Based on the American Association of Testing Materials (ASTM) standards, the maximum particle sizes for DS and TX testing are 1/10th and 1/6th of the width or diameter of the device, respectively. Standard DS devices are typically either circular, with a 2.5-inch diameter, or square, with 4-inch sides; therefore, the largest aggregates that can be tested are 0.25 or 0.4 inches, respectively. Similarly, standard TX devices are made for samples that are smaller than 2 inches in size; therefore, the maximum aggregate size that can be tested is about 0.3 inches. Because the AASHTO M43 aggregates are relatively large, with maximum aggregate sizes ranging from 0.375 to 4 inches, standard DS and TX devices are often not suitable. One option in current practice is to test these aggregates in standard test devices with a scalped sample from which the larger particles have been removed by passing the aggregate sample through the appropriate sieves to meet the ASTM standards. Considering the open-graded nature of these materials, scalping may significantly alter the characteristics and not produce a representative sample. Another option is to perform parallel gradation in a standard shear device. (2) Parallel gradation involves scaling down a material to the desired size while ensuring the grain size distribution is parallel to the original sample. The accuracy of this method depends on several factors related to the particle shape and composition, fine content, and aggregate strength. (3) Because of the caveats associated with scalping and parallel gradation, the best option is to use large-scale devices for the accurate measurement of the strength properties for a representative sample; however, the use of LSDS devices is not a common practice at this time. 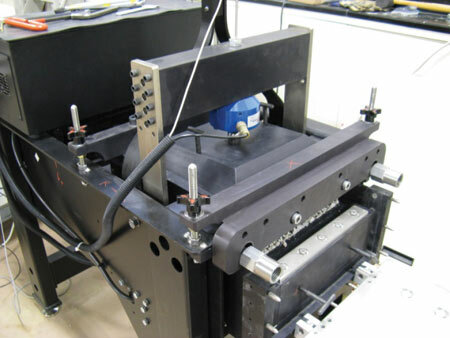 At the Turner-Fairbank Highway Research Center (TFHRC), a 12- by 12- by 8-inch DS box is available to perform LSDS testing on aggregates of up to 1.2-inch maximum particle size (see figure 1). This device was used to measure the strength of 12 classifications of AASHTO aggregates, from No. 10 up to No. 5 (see table 1), under both dry and saturated conditions. The manufactured aggregates came from a variety of sources at locations across the country. In addition, four different No. 8 samples were tested from various quarries to determine the repeatability of the test based simply on the AASHTO gradation. Figure 2 illustrates the results of a sieve analysis that was also performed on each sample to ensure it met the gradation specifications. Figure 1. Photo. Large-scale DS device at TFHRC. Table 1. Selected AASHTO M43-05 (ASTM D448) aggregate designations. Figure 2. Graph. Sieve analysis results of tested aggregates. The shear strain displacement rate was set at 0.015 inch/min for the open-graded aggregates based on the results obtained during the compression phase of testing. The samples were sheared to a maximum of 20 percent of the device length for a total shear displacement of 2.4 inches. Because the friction angle increases with relative density for sands and gravels, an assumed worst-case condition was used by placing the samples with no compactive effort into the shear box. (6) Each aggregate was tested at normal stresses of 5, 10, 20, and 30 psi, which is a typical stress range for wall and bridge applications, to determine the friction angle. Note that before testing, the LSDS device was calibrated for displacement and shear resistance; the load cells measuring normal and shear force were also calibrated. For each applied normal stress, the shear stress was measured as a function of shear displacement. The peak shear stress typically occurred at a lateral strain of 5 to 10 percent of the sample length. The resulting friction angle was then determined based on (1) a best-fit linear Mohr-Coulomb (MC) envelope, which is the current standard of practice, and (2) a Zero Dilation Angle (ZDA) approach proposed by the authors (see table 2). The MC and ZDA methods of determining the friction angle are illustrated in figure 3 and figure 4, respectively, for the No. 8A sample as an example. Table 2. Friction angle results using the linear MC envelope and ZDA approaches. Note: For the MC approach, the peak friction angle reported is with the corresponding cohesion values omitted; for the ZDA approach, the critical state, or constant volume, friction angle is reported. Figure 3. Graph. Linear MC failure envelopes for No. 8A. Figure 4. Graph. ZDA approach for No. 8A. Figure 5. Graph. Nonlinear MC failure envelopes for No. 8A. In the case of the LSDS, the dilation angle (Ψ) is the ratio of the incremental vertical displacement of the sample (Δ γ) to the incremental horizontal displacement (Δχ) measured during testing, where tan(Ψ) = Δ γ/Δχ. (7) At a dilation angle of zero, the change in incremental vertical height of the sample during shearing is zero. As with the friction angle, the dilation angle decreases with increasing applied normal stress in a logarithmic function. The relationship between friction angle and dilation angle is linear (figure 4, for example). (8)The y-intercept of the best-fit linear envelope in the ZDA approach is the proposed design friction angle at peak conditions for a particular aggregate (table 2), which corresponds to the constant volume or critical state friction angle. The difference in friction angles for the AASHTO No. 8 aggregates was apparent when using a linear MC failure envelope, with the highest and lowest peak friction angle measured at 54° and 43° respectively, for dry conditions. Although both are angular, the weakest No. 8 aggregate had flat, elongated particles while the strongest No. 8 aggregate was not flat. Therefore, the resulting dilation angles were different, with the weakest No. 8 having lower dilation angles than the strongest, as expected based on the visual observations of the aggregate shape. Based on the ZDA approach, however, the friction angles were more similar for the No. 8 aggregates. This is because the ZDA approach reduces the friction angle to the critical state, thereby negating the effect of dilation from peak conditions. Figure 6. Graph. Summary of peak friction angle results. LSDS testing of the AASHTO open-graded aggregates resulted in measured friction angles well above the 34° default friction angle typically used in design. Two approaches were investigated: (1) measuring the friction angle as the slope of the conventional, best-fit linear MC failure envelope and (2) measuring the friction angle corresponding to a ZDA approach. The linear MC approach resulted in more scatter within the data and measured cohesion values, but the resulting peak friction angle is conservative for open-graded aggregates and familiar to designers. The ZDA approach resulted in less scatter and provided a more accurate basis for obtaining the critical state friction angle, but requires an extra step in the analysis of DS results. Based on the samples tested in this program to date, the lowest friction angle measured was for the No. 10 aggregates (the smallest aggregate tested) under saturated conditions – 41° and 45° for the MC and ZDA approaches, respectively. LSDS testing is recommended to quantify the actual friction angle and take advantage of the strength of these engineered aggregates to produce more cost-effective designs. The authors propose the ZDA approach to define the friction angle for design when using AASHTO open-graded aggregates. If preliminary analysis is needed before testing, then a default friction angle of 39° is recommended. This recommendation is based on the relationship between friction angle and dilation angle for all aggregates tested in this program and assumes a 95-percent confidence interval; the proposed new default of 39° corresponds to the peak friction angle of 49° (see figure 7), less two standard deviations. Note that this default angle is still conservative with respect to the actual strength properties of the open-graded aggregates tested (see table 2). Figure 7. Graph. Relationship between friction and dilation angles. Additional laboratory testing is planned at TFHRC to further characterize the engineering properties of both open- and well-graded aggregates and to develop a database of material variability. In addition to LSDS testing, large-diameter (6-inch) TX testing is underway for open-graded aggregates. The impact of compaction on strength and dilation will be investigated. Commonly used well-graded aggregates will also be tested in both the LSDS and TX devices. The primary objective of this research is to encourage designers to employ more realistic strength values in design when using these engineered fills. The authors would like to acknowledge the hard work of geotechnical technician, Jan Li, who prepared and tested many of the samples for this study. Special thanks also go to Dr. Phillip Ooi for his feedback throughout the project. Finally, the authors are grateful to Justice Maswoswe and Khalid Mohamed for their review of this testing program and report. AASHTO. (2005). M 43: Standard Specification for Sizes of Aggregate for Road and Bridge Construction. American Association of State Highway and Transportation Officials. Ooi, P.S.K. and Selvarajah, P. (2010). "Use of the Parallel Gradation Technique to Assess the Shear Strength of Reclaimed Asphalt Pavement in Direct Shear." Proceedings, International Conference on Sustainable Built Environment, pp. 219226. Verdugo, R. and de la Hoz, Karem. (2006). "Strength and Stiffness of Coarse Granular Soils." Geotechnical Symposium in Rome, March 16–17, 2006. ASTM D3080. (2004). "Standard Test Method for Direct Shear Test of Soils Under Consolidated Drained Conditions." Annual Book of ASTM Standards, ASTM International, West Conshohocken, PA.
ASTM D5321. (2008). "Standard Test Method for Determining the Coefficient of Soil and Geosynthetic or Geosynthetic and Geosynthetic Friction by the Direct Shear Method." Annual Book of ASTM Standards, ASTM International, West Conshohocken, PA.
Simoni, A. and Houlsby, G.T. (2006). "The Direct Shear Strength and Dilatancy of Sand-Gravel Mixtures." Journal of Geotechnical and Geological Engineering, Vol. 24, pp. 523 549. Bolton, M.D. (1986). "The Strength and Dilatancy of Sands." Géotechnique, Vol. 36(1), pp. 65–78. Houlsby, G.T. (1991). "How the Dilatancy of Soils Affects Their Behavior." Proceedings, Tenth European Conference on Soil Mechanics and Foundation Engineering, Soil Mechanics Report No. 121/91, Florence, Italy. Paikowsky, S.G., Canniff, M.C., Lesny, K., Kisse, A., Amatya, S. and Muganga, R. (2010). LRFD Design and Construction of Shallow Foundations for Highway Bridges. NCHRP Report 651, Transportation Research Board, Washington, DC. Researchers —This research was conducted at Turner-Fairbank Highway Research Center by Jennifer Nicks and Mike Adams of FHWA with the help of geotechnical technician Jan Li of ESC, Inc.
Distribution —This TechBrief is being distributed according to a standard distribution. Direct distribution is being made to the Divisions and Resource Center. Availability —This TechBrief may be obtained from the FHWA Product Distribution Center by e-mail to report.center@dot.gov, fax to (814) 239-2156, phone to (814) 239-1160, or online at https://www.fhwa.dot.gov/research. Notice —This document is disseminated under the sponsorship of the U.S. Department of Transportation in the interest of information exchange. The U.S. Government assumes no liability for the use of the information contained in this document. The U.S. Government does not endorse products or manufacturers. Trademarks or manufacturers' names appear in this report only because they are considered essential to the objective of the document. Quality Assurance Statement —The Federal Highway Administration (FHWA) provides high-quality information to serve the Government, industry, and public in a manner that promotes public understanding. Standards and policies are used to ensure and maximize the quality, objectivity, utility, and integrity of its information. FHWA periodically reviews quality issues and adjusts its programs and processes to ensure continuous quality improvement.